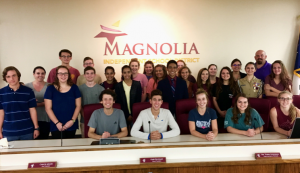 The Magnolia Independent School District (MISD) and the Voter Awareness Council (VAC) are pleased to announce a student led get out the vote campaign at the two MISD comprehensive high school campuses. Under the leadership of faculty members Mrs. Brittany Lee Marrs and Mr. Jeremy Day, the high schools Senior Class Leadership Team, pictured below, will execute a project designed to inform their fellow students on their citizen-given right and obligation to vote. This effort will include a voter registration drive, student research on each of the upcoming November ballot items, unbiased student meetings and discussions on the ballot items, completion of sample ballots by each voting student, and then MISD provided transportation of voting students, faculty and staff to actually vote during the early voting period. “We are very pleased to be working with the Voter Awareness Council on this project to have a student led effort to get out the vote in our schools” says MISD Superintendent Dr. Todd Stephens. “We hope to leverage this effort not only on the upcoming November election but each and every future election as well,” adds Dr. Stephens. Magnolia Independent School District provides an educational environment to approximately 13,000 students, offering a well-balanced curriculum including advanced academics, concurrent college and high school enrollment credit, career and technical career paths, early childhood and a strong academic core. We provide an educational environment that enables all students to develop essential academic skills for a lifetime of learning and prepares students to be responsible, contributing citizens in a diverse and changing world. The Montgomery County Elections office is conducting a voter registration drive at several locations in the county in an effort to prevent problems at the polls on November 8. Any eligible Montgomery County resident may submit an application at these locations during the times listed. Voters who are already registered may check their registration information to make sure that it is current and update it if needed. Voters who have moved, registered at DPS, or are unsure whether they are registered are strongly encouraged to do this, either at the voter registration drive, at Election Central, or by mail. Visit www.MontgomeryVotes.org or call Election Central at (936) 539-7843 for more information about voter registration, the November 8 election, and Sample Ballots. The deadline to register to vote and be eligible to vote in the November 8, 2016 election, or to submit an address change that will be effective for the election, is October 11. 8:00 am – 4:30 pm 400 N San Jacinto St.
8:00 am – 4:30 pm 19100 Unity Park Dr.
9:00 am – 5:00 pm 21005 Eva St. The Voter Awareness Council (VAC) is pleased to announce the first annual Woodlands Township Board of Directors Candidate Reception to be held on Wednesday, September 27, 2017 at the Black Walnut Café located at 9000 New Trails Dr., The Woodlands, TX 77381. The informal reception will run from 4:30 to 5:45 and will be a short walk from the regularly scheduled Township Board meeting to be held next door at 6:00. This event is designed to give the candidates and interested Woodlands residents an opportunity simply to mix and mingle in a casual, informal setting. Light refreshments and a cash bar will be available to everyone. “We also wanted an opportunity to thank all of the candidates for their willingness to serve our community” says Amy Lecocq, VAC Vice President and initiator of this event. “There will be plenty of time for candidate forums, campaign events, etc. in the future – we just wanted to add a little fun to the process”. The Woodlands Township Board of Directors is comprised of seven at-large positions with two-year term elections held every November. This year Position #5 with John McMullan as an unopposed candidate, Position #6 with Ann Snyder, and Position #7 with Laura Fillault and Carol Stromatt as candidates will be on the ballot. Early voting starts October 23rd, and Election Day is November 7th. VAC is a local non-profit corporation established by a number of Montgomery County residents designed to help encourage and equip citizens to vote. VAC’s mission is to inform and educate citizens on our local elections, improve the overall voting experience and to increase voter turnout. See www.vactx.org for more information. Questions about this event can be directed to VAC President Steve Leakey at spleakey@yahoo.com.